I’m just back from a trip to Kenya and London and as they say in the UK, “cream crackered” (really tired). 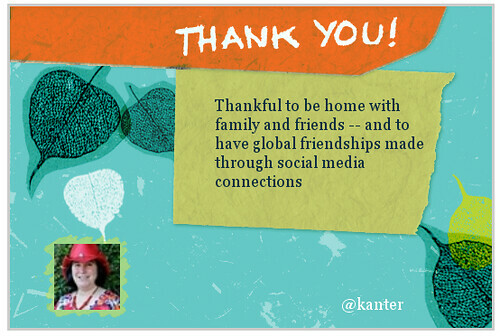 I’m really grateful to be home with family and friends – and for the many wonderful global friends I have around the world made through the connectedness of social media. But before I rest, I wanted to let you know that it’s Tweetsgiving time again, a global celebration of gratitude and giving lasting 48 hours to support the work of EpicChange. Founded in 2008, the original TweetsGiving celebration was implemented by a small group of volunteers and it generated thousands of grateful tweets from around the globe. As the event has evolved, TweetsGiving is not about Twitter. It’s an event to express the gratitude and the transformative power our thankfulness can have when we share it with one another. This year, TweetsGiving becomes Epic Thanks to indicate the broader impact of the event. Over the past two years, from the gratitude of thousands, this global event has built two classrooms and a library in Arusha, Tanzania, where the twitterkids, led by local changemaker Mama Lucy Kamptoni, learn and grow at one of the best primary schools in their country. This year, the celebration will spread to honor even more changemakers in other parts of the world. I spent Thanksgiving biking around, tweeting gratitude, and taking in the new Harry potter film! Time well spent! I just had to come here and say Thank YOU Beth for being a shining light showing the way into social media for nonprofits! And for buying a copy of my book to give as a gift to someone else! And tweeting about it! I sent it out today.